It is a common misunderstanding that a Catholic who divorces his/her spouse is no longer free to receive Communion. There are even some who think that divorced Catholics or those who do not marry by the Church are excommunicated. Perhaps you know someone who no longer attends Mass or is otherwise alienated from the Catholic Church because of his or her marital status. While these can be complicated matters and every person’s situation is unique, I believe it is my duty to present a few important teachings on marriage and the freedom of Catholics to receive Communion. The Catholic Church teaches that marriage — instituted by God — is a natural good open to men and women who profess any faith or no faith. The Church recognizes the marriages of non-Catholics and does not presume to determine the way they are to marry, be that a religious or civil ceremony. So, for example, the Catholic Church considers as valid the marriage of two Methodists who marry before a justice of the peace or a Jewish man and a Baptist woman who marry before a Baptist minister. It does not, however, mean that they are any less Catholic, or are rejected by the Church or, by any means, excommunicated. In fact, these Catholics are equally members of the Church and they have the same freedom and obligation to participate in Sunday Mass as do all Catholics. At Mass they benefit from receiving God’s word communicated in the Scriptures and joining the community of the faithful in offering prayer, worship and praise to God. Although they are not free to receive Communion, they are invited to make a “spiritual communion” by their personal prayer with Almighty God. The Catholic Church does not recognize the authority of civil officials (judges) to break the bond of marriage by divorce. There are situations, however, where the separation of the spouses is inevitable or, as in the case of spousal abuse, even necessary. A Catholic who is civilly divorced is no less a part of the Church nor are they — by that fact alone — prohibited from receiving Communion or the other sacraments. Catholics who are separated or divorced do have a moral obligation to provide for their minor children and to fulfill other just obligations imposed by the civil court (e.g. a just alimony). They also are to live a chaste life. The Catholic Church loves and embraces all her children. We all stand before God in need of His mercy and none of us is free to judge the other, especially his or her conscience. Without setting aside or watering down the true nature of marriage and its rights and obligations, the Church recognizes with the heart of the Good Shepherd that quite a few of her own are in difficult marital situations. Far from rejecting these loved ones, the Church — and individual parishes — can and must always be a place for their healing, reconciliation and peace. Well said, as only you could do it Msgr. Souckar! This clarification on marriage is so sorely, esp. in light of recent events. It's easy to get pessimistic as it feels the meaning and context of marriage is getting so lost in our culture. We're going to have to continue to pray and discern with the Church as to how we're going to proceed and catechize all of the people who are so hungry to know more about our beautiful teachings on marriage. Thank you Msgr. Souckar for this informative article. This is a blessing to have you as Pastor. My question is "quid for those divorced women/men but living openly or secretly in fornication?" As a Catholic, I really think that Catholic families should be more informed through this kind of article in order to be more motivated about their family. While I appreciate this much-needed article, I just want to emphasize what Msgr. mentioned only briefly. Divorced Catholics "ARE TO LEAD A CHASTE LIFE." In other words, they should not remarry. If they do remarry, then they are essentially in the same situation as Catholics cohabit or have an invalid marriage. They are morally NOT in an acceptable state to receive the Eucharist. It seems that some readers may have misunderstood that. Thank you Msgr. Souckar. Very informative, concise and clear. It�s a concise summary of what canon law and the catechism have to say about divorced couples and communion. Let me just add that Pope Francis has spoken often and with great concern about this state of things, and that he called the October synod for a complete discussion of the communion question, within the overall search for pastoral approaches to marriage and family. Let us pray together for the bishops who will take part, and that the Holy Spirit guide them to speak boldly with one voice. 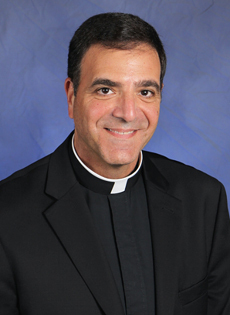 Excellent article Msgr. Souckar Thank you! Thank you so much for this very informative article. There are so many misconceptions about divorced Catholics and/or those Catholics who marry a divorced person. We need more information and more dialog about these issue. I'm so happy to read your blog; it was very enlightening and I look forward to reading more. Thank you for this informative article. I myself was in a marriage which ended in divorce not by my choice. It is important to have clarity in the teachings of the Church. I will pass this information to those I come in contact with in my ministry to the divorced in the Church. I would love to see an article clarifying the annulment process as this is another area of difficulty for those in the process of divorce. Thank you! Thank you! Thank you! for this informative article. There is so much misunderstanding and inaccuracy regarding the Church's teaching. Your clarity in the various situations will illuminate for some and provide for others accurate information. Thank you also for reminding us to look to our brothers and sisters with love and understanding. Msgr, thank you for this article that will clarify to many, I pray, the Church's stand about Marriage, Divorce, and being a practicing Catholic and attending Mass, and even Communion whenever after receiving Absolution after a confession. God bless you always!